Diane von Furstenburg and Barry Diller will provide the bulk of financing for a $165 million dollar park proposed for the site of a crumbling pier along the Hudson River, Gothamist reports. A crumbling old Hudson River pier once used by ocean liners like the Lusitania will be torn down and replaced by a 2.7 acre park on the water featuring rolling hills and an outdoor amphitheater. Mayor de Blasio is expected to reveal further details about the park at a press conference this morning, but the Hudson River Park Trust has revealed that the park will be largely financed by a foundation formed by the billionaire couple Barry Diller and Diane von Furstenberg. 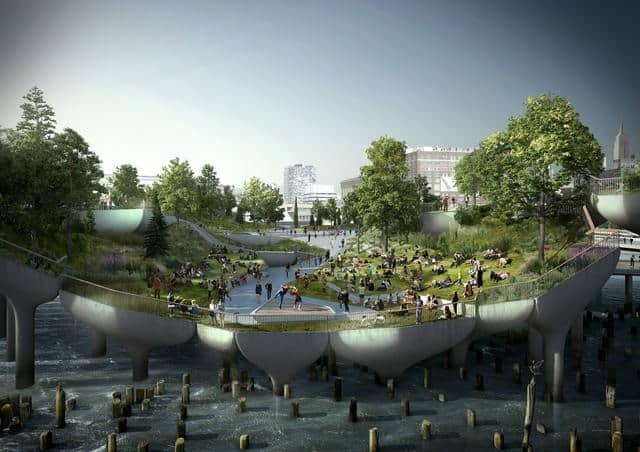 …Von Furstenberg, the fashion designer, and Diller, the former head of Paramount Pictures and Fox, have committed $130 million to the park, with the city pledging another $17 million, and $18 million from New York State to build an esplanade to the pier park. 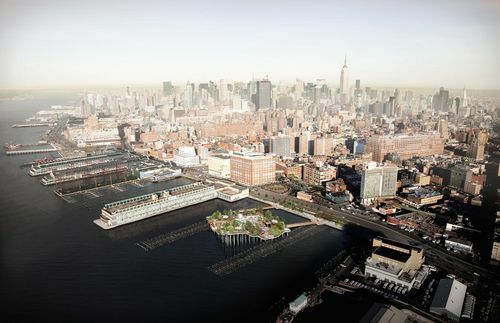 The park will be between the pile fields of Pier 54 and Pier 56, which will remain in order to provide a fish habitat. The park will be erected at the end of 14th near the Meatpacking District – also Von Furstenburg's fashion headquarters (are you watching House of DVF yet?). The park's planning is being criticized by city advocates over a "lack of transparency" according to Gothamist. The Hudson River Park Trust’s board, the Army Corps of Engineers, the state Department of Environmental Conservation, and the public will have a chance to weigh in before the project is approved.